This Christmas Santa is bringing my family 2 iPods and the latest iPhone which made me think that it’s that its getting close to that perfect time of the year again to recycle your old gadgets to make way for the brand new ones. Not only is it a great time to recycle but you can also make yourself some nice easy cash to spend in the January sales. Money4urMobile – Money4urMobile are part of Redeem Plc who are one of the oldest and most popular recycling companies in the industry. They are definitely worth checking out as they offer some of the highest prices for mobile phones, iPods, iPhones, iPads and other tablet computers which no doubt a lot of people will receive in their Christmas stocking. As well as the electronic devices above, as of this year Money4urMobile will now also buy MP3 players, digital cameras, handheld games consoles and SAT NAVs. Payment is sent via cheque or bank transfer quickly and easily on the same day that they receive your items. O2 Recycle – O2 Recycle will pay you cash by cheque or BACS for recycling your old digital cameras, mobile phones, MP3 players, games consoles and SAT NAVS. You do not have to be an O2 customer to use this site. One of the great things about O2 recycle is they don’t keep any of the profits, all the money they make is donated to their Think Big charity which helps to change the lives of young people who need help and support in the UK. By using O2 Recycle not only will you get some extra money in your pocket for your unwanted electronics but you will be doing your bit for the environment and the Think Big Charity. Post Gold for Cash – Gold is currently at an all time high so now would be a great time to dig out any unwanted jewellery and send it in to be recycled and re-sold. For doing this you can earn a whole heap of cash. Not only can you sell jewellery but pretty much anything that is made of gold, silver or other precious metal including cuff links, charms, watches, coins, collectibles, silver flatware, decorative pieces and even gold teeth. Post Gold for Cash provide you with a free £500 insured envelope to send your unwanted jewellery in. Once it’s received it will be checked over, weighed and valued and your money will be sent out via cheque, BACs or cash within 48 hours. Music Magpie – This was the first website in the UK that allows you to turn your old CDs, DVDs and video games into cash. Since the site launched they have already paid out millions of pounds to their users. By entering the barcode of each CD, Game or DVD on their site they will provide you with an instant valuation. As of October 2012 they will now buy electronic gadgets and other tech. The great thing about selling on Music Magpie is that you can package up and send everything in the same box. Once it’s all received your items will be checked and payment sent via cheque, bank transfer or e-vouchers (M&S) within 2 days. Trade Your Games – If you get any new console games for Christmas and want to get rid of the old ones then Trade Your Games is a great site to check out. They are a bit like the trade in shops on the high street where they will accept your unwanted games in return for cash or credit. If you decide you want cash then you can request it by cheque, BACS or Paypal. Alternatively you can use the credit to buy 2nd hand games directly from their site. One thing everyone gets over the Xmas period is Christmas cards. In fact over 1 billion are sent and received in the UK alone. Rather than just putting them in your recycle bin once the festive season is over you can take them to your nearest M&S store in January to be recycled. For every 1000 cards that M&S receive the Woodland Trust will plant one tree, last year over 8.5 million cards were donated allowing them to plant almost 8500 trees, they are hoping to get more this year. You can find more details on the M&S card recycling scheme here. 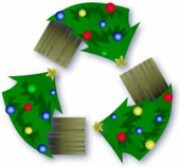 Do not use igadgets recycled. I foolishly used them having had a good offer from them for my iphone 4 and also seeing lots of decent star rating reviews. However my experience has not been good and the more I’ve looked into them since, the more bad reviews and similar experiences I have seen. They offered me £140 for the iphone in ‘working’ not new, condition. I sent it in and it was in fantastic condition and even sent to them in its original box. I always had screen protectors on it so there was not a scratch anywhere. They reported back that it had wear to one corner on the bezel – the silver edge. There’s no way it had a mark on it. However having paid £7 to send in it left me between a rock and a hard place. I talked them up from an £80 (nearly half the original for a tiny wear?) to £100 and had to accept that otherwise i would have incurred more cost to send to another company. Honestly, they are con-merchants. Advertising higher prices and not standing by them. Do NOT use these people and please pass on this review.